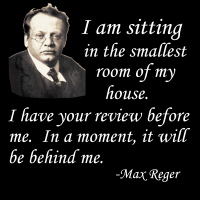 Composer Max Reger‘s disdain for music critics was no secret, as this hilarious put-down attests! Now you can own this humorous quote yourself (or present it to your favorite musician or composer) on any of these fine gifts shown below! Buy it now on a t-shirt, hoodie, mug, tote bag or other quality gift or apparel item. Choose something for your favorite music teacher or student, exclusively from GearGems!